My Valentine’s gift to you is one last post about our Palmer House paranormal investigation! Cause nothing says I love you quite like a recap of my interview with a ghost! 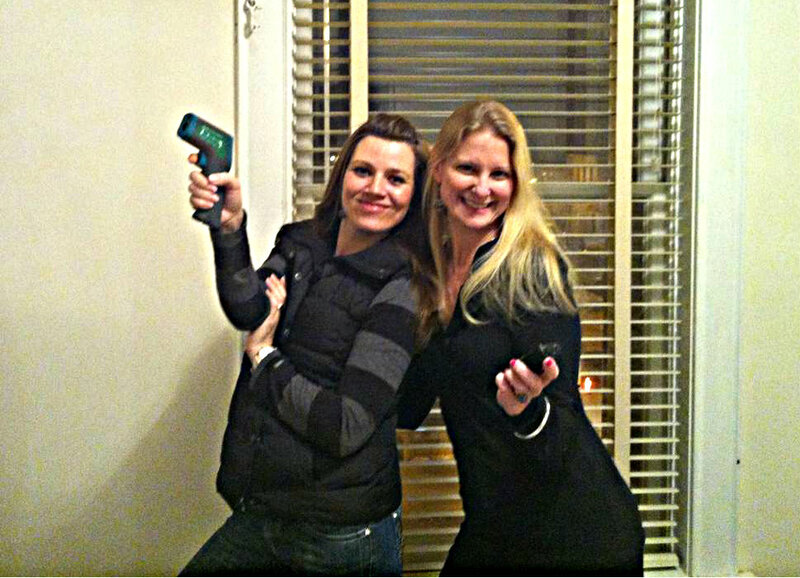 I have to share this picture because we are so Charlie’s Angels with our ghost hunting equipment! Plus, it’s Valentine’s Day, and this is a girl I love – one my all-time besties, Cara Miller. This is us before our night in a haunted hotel. And this is us after! 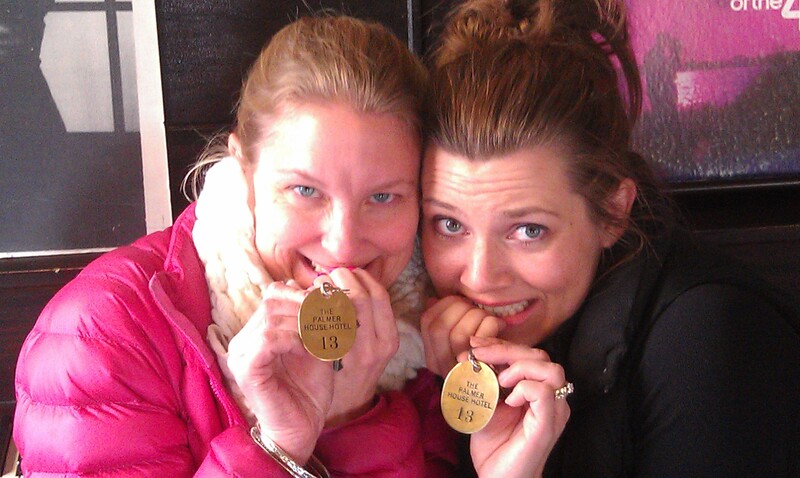 We survived!! While in the far, back room of the basement, where the owner, Kelley Freese, had found rib-bones buried under the steps, I was struck with an instant headache. At one point, while I was in that same room with another investigator, Shawn McCann, I thought I heard footsteps behind me. Unfortunately, Shawn was blocking the only doorway, and I kinda-sorta tried to climb him like a terrified cat trying to scurry up a tree. Luckily, he’s a sturdy guy, so he could take it. I, on the other hand, am not so sturdy, and I’m pretty sure I bruised a rib as I tried to escape over him. Lots of these experiences could be explained away. We’re in an old basement, it’s cold and drafty. The electromagnetic energy in the basement was pretty high in some areas, which could easily explain a sudden headache. And how do I explain trying to claw my way over the body of my friend? Well, it was pitch black. I was standing in a room where human bones had been unearthed. And I’m a fiction writer, so it’s possible the footsteps were a figment of my over-abundant imagination. But one experience was shared by all of us that is not so easily explained. While we sat in a basement room, all lights off, an EMF detector and a maglight (turned off) on a stool in the center of the room, we had a “conversation” with a spirit. Okay, that sounds crazy, I’ll admit – but it’s true! We asked questions and that maglight with the twisty top turned on and off in response (on for yes – off for no) completely untouched by human hands! We asked a variety of question, trying to determine who we were communicating with. We concluded that it was a woman, likely over the age of 30 who had been born in the 1800’s and had died of natural causes. When one of our investigators asked in German if she spoke that language, the light turned on (yes), but each subsequent question he asked in German was not answered until he translated it for the rest of us in English at which point, the light would turn on in response. So we asked our new friend if she prefered speaking English with us, and the light turned on (yes). It’s interesting that at one point, the room where we were sitting had once been a classroom for German immigrant children. While trying to determine how the spirit was connected with the Palmer House, we asked a variety of questions such as if she had been a maid in the hotel or a teacher in that very room, or if she was a member of the Palmer family. Each of these questions was answered with a turned off flashlight (no), but when we asked if she had been a working girl when the hotel was rumored to have been used as a brothel, the light flickered on in such a way that made us believe our spirit friend was embarrassed to answer yes. We later tried to replicate the same kind of quick, half-on flicker by turning the flashlight on ourselves, but we could not. The spirit seemed particularly interested in myself and Jenna. Both of us have long brown hair. So someone in the group asked if the spirit had long brown hair. The light came on (yes). At one point, I felt pressure on my head, almost as if someone had a hand on each side of it pushing lightly. Another team member was touched. Another became suddenly chilled. And two others noticed a sweet, flowery fragrance waft past them. With each of these incidents, we asked if the spirit was responsible, and the flashlight turned on (yes). Several times we asked if the spirit would like us to give them a break, and the light would turn off (no). Then we asked if they’d like us to stay and keep speaking with them, and the light turned back on (yes). After more than an hour, we walked away, feeling like we’d made a new friend. A friend we couldn’t see and likely won’t meet until we make our own transition to the great beyond. But one day, when we do meet, hopefully over an all you can eat fried chicken and mashed potatoes buffet in heaven (because I just know that heaven has to have fried chicken and mashed potatoes and I’m praying it’s all served at a germ free buffet where we get to gorge ourself without ever gaining weight or having to unbutton our jeans), I’m going to give that girl a big hug and say, “Thanks for making our time at the Palmer House so fun by chatting with us!” Then we’ll have a big messy food fight, flinging ‘taters and gravy from golden spoons and not have to clean it up because it’s heaven and you don’t have to clean up messes there. And because there won’t be any germs we could totally eat the food off the floor, or walls or the shoulder of the dude standing in front of us…umm…I have a sick love of mashed potatoes and the thought of the heavenly hosts just scooping them up and wasting them makes me sad, so in MY heaven, I will be licking them off of things (and people). I’m sorry – I don’t know how I digressed to this point, but whatever. So, with the image of me licking potatoes off of random people after a heavenly food fight, I will concluded my recap of our Palmer House investigation. And just in the nick of time, since this Saturday we’ll be doing an overnight investigation of the Mounds Theater in St. Paul, MN!